Now, here are two guys who wouldn’t know the Atlantic Meridional Overturning Current from the Circumpolar Current or a Hadley Cell from a Polar Vortex. Neither has the background to understand, let alone to contribute to research. You’d just as well have two 5th graders arguing. Then, Cruz is a lawyer. I learned long ago that law is a sort of fundamentalism which argues to text and precedent. When you are unfortunate enough to go to court, you hope the verbal map of legal “reality” matches the physical world reality in which your incident happened. Often it doesn’t. We hear about people being absolved of crimes years after being convicted. Doubtless there are many innocent that are never absolved. Of course we never hear about them! Let’s not talk about who pays Senator Cruz and how – you know anyway, since he wants to be President. Real high stakes! Mr. Mair is obviously used to gentleman debate of academics, where you are supposed to use experts for things you don’t research yourself and specify where your claims come from. Go for the jugular is not his thing. Being right is more important than wining on points. The video is not even a classy debate. Sen. Cruz may not be aware how much he looks like a bully. But some love that, just like they love to see a hero beat up the bad guy. This video went wild in Right-leaning circles. Comment: Correct, but not assertive. Comment: Gentlemanly, but not long on points. Comment: Cruz ignores this key statement and instead goes on the attack with another assertion. Cruz: Is it correct that the satellite data over the last 18 years demonstrate no significant warming? Comment: Here Mair made a big mistake. No such data exist, it is a very serious mistake for Mair not to have called him on it. His experts behind him, who he whispered to, apparently did not know, either. Mair: [Confers with staff.] Based upon our experts, it’s been refuted long ago, and there is no longer, it’s not up for scientific debate. Comment: A firm assertion “that data doesn’t exist” would have set Cruiz back on his heals. Mair’s experts should have known this, even if he didn’t. They improvised and the rout began. If Cruz denied their assertion that it didn’t exist, all they would have had to do is ask him for the name of the study or the scientists. In fact, even if the study had existed, subsequent studies disproving it could have been cited. Cruz: “The problem with that statistic that gets cited a lot is that it’s based on one bogus study. And indeed your response . . . I asked about the science and the evidence, the actual data, we have satellites, they’re measuring temperature . . . Comment: This was not a “bogus” study. Cruz claim must have been taken from the right-wing myth makers. The research on acceptance of climate scientists is here. It was published by NASA. It involves 18 American scientific societies and over 200 worldwide! It shows the “Temperature Anomaly” graph with figures from four of the most prestigious scientific bodies on earth in climate studies. There simply is no anomaly! So, the only “science” Cruz brings up is one claim he got out of climate change denier literature. That seems to be his source and his limit. P.S. Don’t miss all the good stuff at the bottom of the last reference! This week, Senator Ted Cruz held a hearing to attack the clean air and clean water safeguards that protect millions of families all across America. Sierra Club President Aaron Mair was there to talk about how communities of color, which are disproportionately affected by pollution and climate disruption, rely on these safeguards to protect them. A friend to big polluters, Cruz unsurprisingly tried to cover all their talking points. His game? To attack the climate science that shows how carbon pollution from burning fossil fuels is causing climate disruption in the first place while assailing the Clean Power Plan, which would allow us to act on climate disruption and protect people’s health. 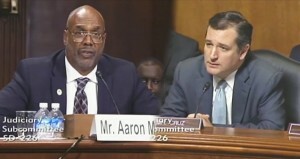 Well, Sierra Club President Aaron Mair has a few things to share with Senator Cruz. Check out his response below. There’s an old lawyerly adage that “if you don’t have the law on your side, argue the facts. If you don’t have the facts on your side, pound the table.” You did a very good job pounding the table this week. This week, you held a hearing on the clean air and clean water safeguards that protect millions of American families. I testified because I wanted to talk about how these safeguards are especially critical for people of color and low-income communities, who are disproportionately affected by pollution and climate disruption . 0: The number of accurate data points you shared when attempting to claim that the climate wasn’t changing. According to the National Oceanic and Atmospheric Administration, average global temperatures have been steadily rising for the last three decades. 97%: The percentage of scientists who agree that the climate is changing and that human activity is the cause. 2015: expected to be the hottest ever recorded. 7: 7 out of 10 African Americans live in areas with air that is unsafe to breathe. 48217: that’s the zip code of the neighborhood in Detroit I just visited – one of the dirtiest zip codes in the nation. There, massive mounds of petroleum coke waste and coal incinerators are within blocks of schools – further evidence that the lack of protections has turned Detroit from the epicenter of opportunity into the epicenter of the Asthma epidemic. Schools and smokestacks do not mix. 90,000: The Clean Power Plan can help us prevent 90,000 asthma attacks in children, save consumers $155 billion on energy in the next decade and create 360,000 new jobs . Energy savings, more jobs, healthy families, and safer communities? I think 100% of the American people would go for that. the importance of this debate. I am concerned about climate change, and this is a clear explanation for why people deny climate change. I’m sorry, but Aaron Mair was thoroughly trounced by Ted Cruz. He was clearly unprepared for the debate, and could not provide an adequate response to Cruz’s questions. The Sierra Club should have sent in someone who knew what they were talking about. This is embarrassing for us. Previous post: FRACKING is still a Dirty Word — Think About That!